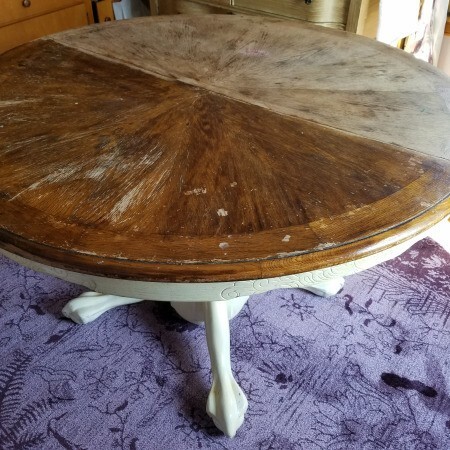 We have this old 48" round oak dining table that someone painted white. We started refinishing it and found scroll work on the sides under the top, where the leafs go in. It is gear driven. The feet are very detailed and look like a lion or tiger head. 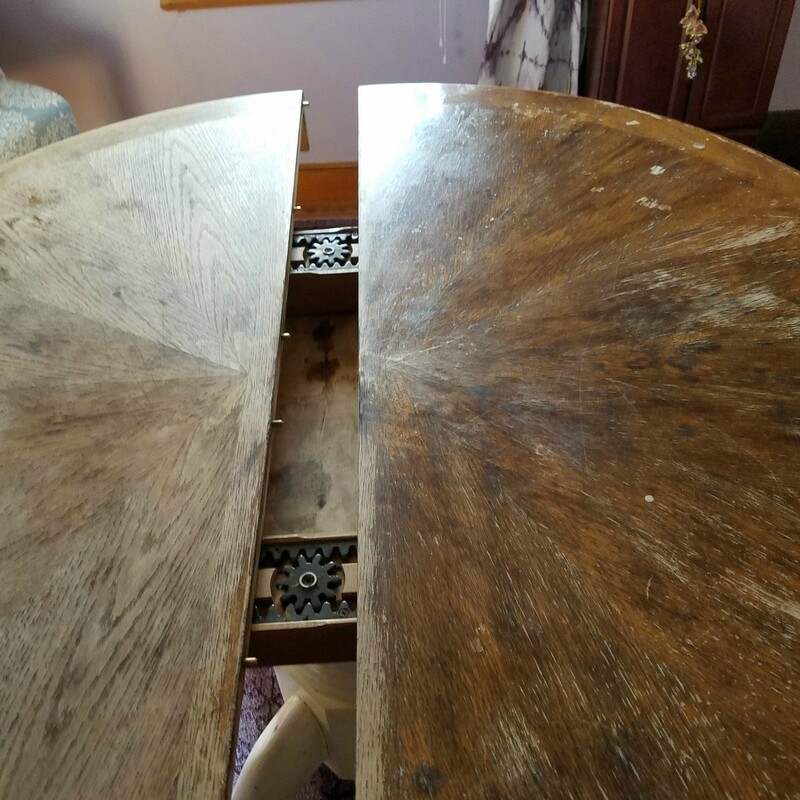 I am just wondering if anyone could give us information about this table - it's heritage, brand, value, etc. You need to find identifying markings. 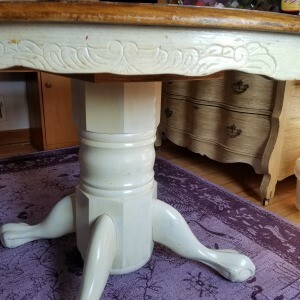 This could be a very expensive table or a knockoff. Good luck. It looks solid and heavy. I think you can get some money for this. To me, this looks like an Amish style, gear extending, oak table. The base is pedestal style. The legs are some animal type as you mention...not clear what...my screen resolution isn't the best and when I blow up the pix it blurs out. 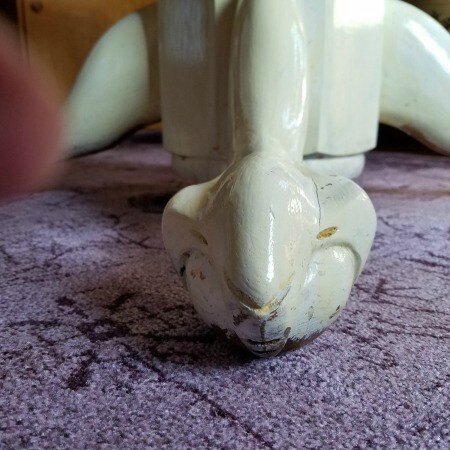 The scroll work on the edges is unusual and not something I usually see in Amish pieces, although I am not an expert in Amish pieces, but we have a lot where I am so I see it around a lot. Most of what I see doesn't have the extra decorations like this....which may mean it is an Amish STYLE and someone (person or company) else made it in the style of the Amish. It is quite lovely. To age and value it is hard as it has been refinished and now stripped and that affects value, and dating it is hard because Amish styles don't change that often so it could be from any time in history just about. If you have a reputable second hand furniture place near you, they can look at it better and see if there is a date etched in somewhere, or markings on the underside or the gears that will give more info. I can tell you that newer, pristine tables like this, where I am in PA, fetch up to $2000 with the chairs. The table alone, may fetch $1000 to $1200. These are retail values--if I went to a nice resale shop. Your area may be totally different depending on supply and demand. I hope this helps. Please post back if you can get an expert to actually look at it--it person--and what they tell you!! Thanks for sharing it!